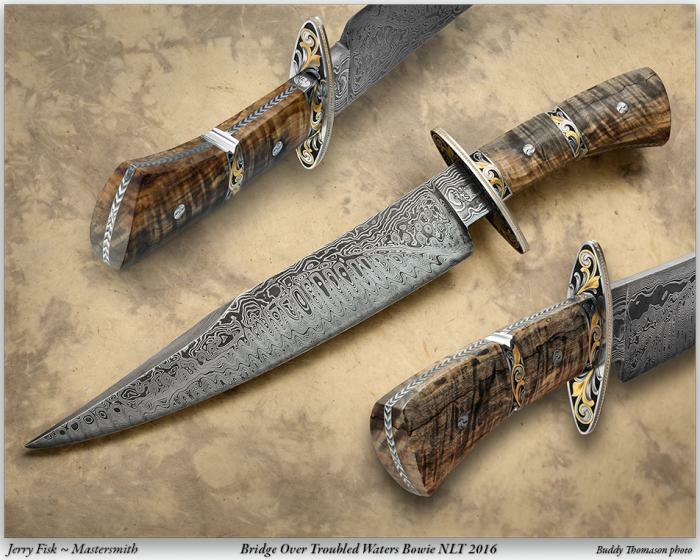 This is the complete "Bridge over Troubled Waters" bowie that uses the steels from the World Trade Center bulding #2 and steel from the bombing of Pearl Harbor. The wood is Horse Chestnut that is the last of the 13 trees that George Washington planted. Gold inlay is 24kt. Organic engraving. This bowie took a long time to do as you can guess and yes, I did test it for cutting ablity when I finished the blade. It sliced a ham so thin the in-laws said they would not come back and visit. It was important to me to preserve these materials with something that is beautiful to remind us that though we have bad things in our lives something beautiful will come of it one day. I had been asked to make an Historical bowie to be put on display for the Presidential inauguration in DC. I may use this one or if I sell maybe they will let me put it on display.